Maggie Jayne Gets a Much Needed “Win” at Advanced Veterinary Care Center! It has been a few months unlike any other for Ray King of Pembroke Pines. His mother recently passed away of congestive heart failure. 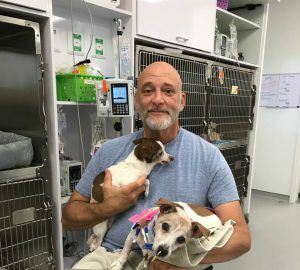 Then, just weeks later, her beloved Chihuahua Pebbles who came into Ray’s care also suffered congestive heart failure and was being treated at Advanced Veterinary Care Center in Davie. But more bad news followed. 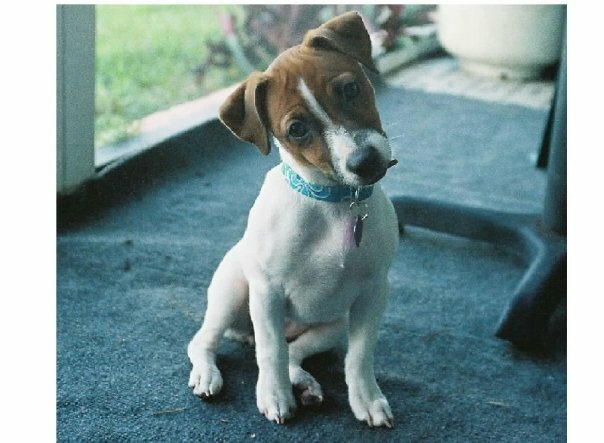 Ray’s own dog Maggie Jayne, a 13-year-old Jack Russell Terrier wasn’t acting at all like herself. “All I knew is that she couldn’t go to the bathroom, her breathing was labored and she was listless,” says Ray. Dr. Jon Rappaport, Co-Medical Director and the ICU nursing staff started CPR. “Maggie Jayne died 18 minutes after leaving my family veterinarian,” says Ray. But the AVCC team never gave up and after a few minutes of continued resuscitation, she eventually responded and her heart began beating spontaneously. Maggie Jayne’s battle was far from over, however. A diagnostic evaluation revealed the cause of her cardiac arrest. She had septic peritonitis; her abdomen was full of fluid containing bacterial infection and inflammation. And, she had a bone lodged in her intestine, causing further damage. 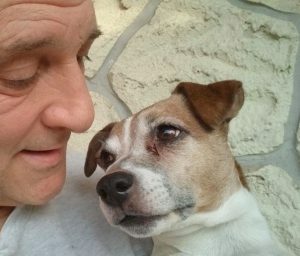 Doctors advised Ray that in most cases, a septic peritonitis carries a 50% chance of survival and with a dog that just suffered a cardiac arrest, those odds are even lower. But Ray was undeterred by odds and he believed in the AVCC team. He was ready to do whatever was needed to save Maggie Jayne. Dr. Rappaport was able to remove the bone from her intestine, decontaminate and place a drain in her abdomen, and transition her to the initial stage of her recovery. While Maggie Jayne was recovering from surgery, Pebbles had another bout of congestive heart failure, collapsed and was ventilated. Sadly, Pebbles passed away and the entire ICU staff at Advanced Veterinary Care Center was awash with tears. “I’m a single guy who just lost my mom and then my mom’s dog. I couldn’t have another loss. 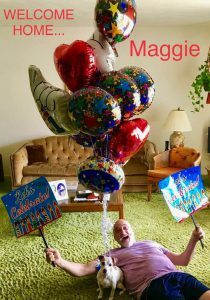 Maggie Jayne is my life,” says Ray as he chokes back tears recalling that day. Maggie Jayne’s care was truly a full staff effort. “I said to the team, ‘THIS guy and THIS dog needs a win. No pressure, let’s do it,’ ” says Dr. Rappaport. Maggie Jayne spent 12 days in AVCC’s Intensive Care Unit under the care of highly skilled ICU nurses, emergency doctors and Board Certified Emergency and Critical Care Specialist, Dr. Chris McLaughlin. A feeding tube was placed directly into Maggie Jayne’s stomach from outside her abdomen by Board Certified Internal Medicine Specialist and Co-Medical Director Dr. Jeff Toll. Less than 5% of all patients who suffer cardiopulmonary arrest in the hospital survive to go home to their families. But, in time, Maggie Jayne regained her strength, started eating on her own and was able to go home with her truly dedicated dad. “She is now eating very well and wants to play,” exclaims Ray. Click here to learn more about Advanced Veterinary Care Center and meet our team! You can also follow Maggie Jayne’s adventures on Facebook here!